Updated Frequently from Sub-Packs. Not HDRP ready, Uses PBR - Standard shaders. A set of shaders for Hair, Skin and Eyes. This set includes 4 of my best shaders for characters, creatures and hair. (not HDRP compatible, only a preview version of the Hair shader is available, see product link). Hair Shader Simple - An optimised hair shader. Hair Shader 2.0 - A more advanced shader and one of my best sellers. Simple SSS Skin Shader - Ideal for sub surface scattering control for skin, thin objects such as leaves, paper, gel, translucent rubber and more. Eye Shader - Make many kinds of eye designs, increase or customise the pupil size, add your own iris designs with ease and colour/animate them all in one shader. 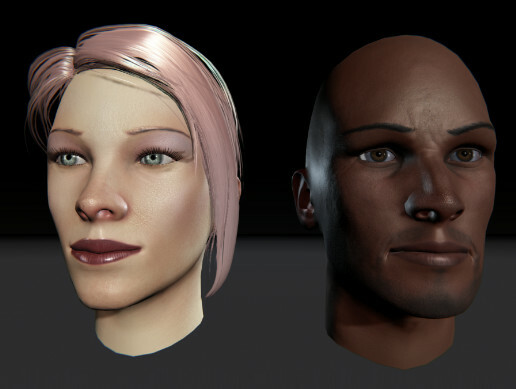 Comes with Male and Female Head, 2 Example Hair wigs, several materials and shaders for each. Eye shaders and several eye materials. Highly advanced shaders with great control, get in touch if you require additional features.